Hello and welcome to my blog. Today, I am going to share with you the card that I created during yesterdays YouTube Live. I did a basic lesson on how to watercolor; and the By the Bay Stamp Set was the perfect stamp set to do this with. Here's a look at the stamp set that inspired today's card. Here's a look at my card. I started out this card by taking a piece of Pacific Point cardstock (cut at 4 x 5 1/4) and cut out a circle in the center top 1/3 of the card. 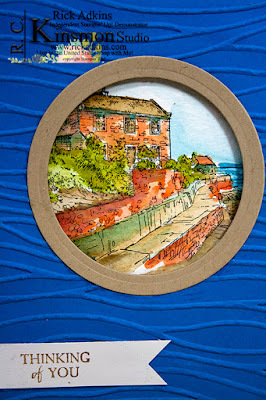 Next I used the Seaside Texture Impression Embossing Folder and sandwiched the two together and ran it through the Big Shot. Each Big Shot is different and you may have to adjust how you ran it through. My Big Shot and this embossing folder works best if I either use the original platform set on the embossing tab or if I spritz it with a little water before running it though with the embossing platform. Next I used the largest and third largest circle framelits in the Layering Circle Framelits and cut out a Crumb Cake Circle frame. At this point I set the card front aside and worked on the watercoloring. 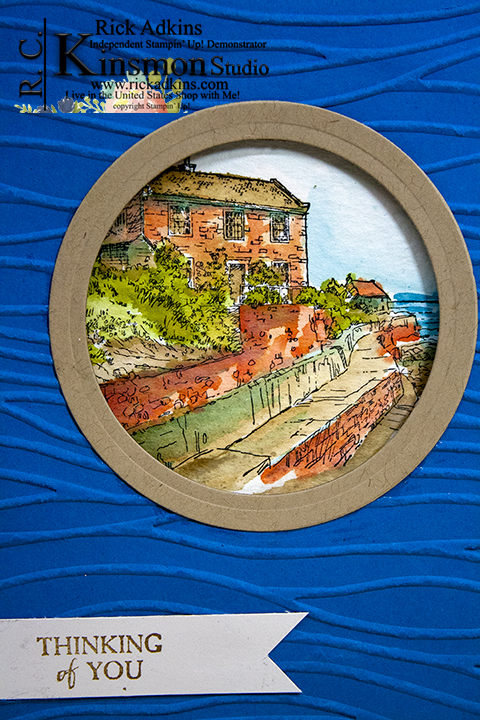 I stamped the bay image on a piece of watercolor cardstock(cut at 4 x 2 3/4) I actually ended up cutting the watercolor cardstock down after I finished to fit behind the circle cut out. My top tips for watercolors are start light and work your way to the darker shades. Don't squeeze the Aqua painter that adds more water to the ink or paint on the brush and waters down the color. The lighter things are the farther away they are, and the darker something is the closer it is. In order to get the watercolor piece placed just right I had to lay down my card front where I wanted it to be and trace the inside of the circle with a pencil. I then added the watercolor piece to that area with a little multipurpose liquid glue. 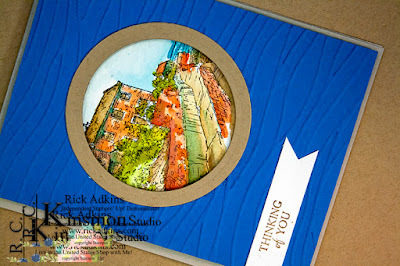 To create a the window and make it stand up I added a lot of Stampin' Dimensionals behind the card front. 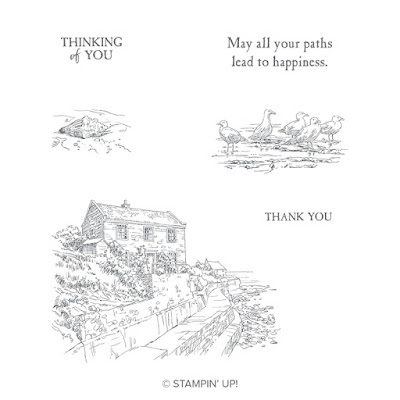 For the inside of the card I simply stamped the sentiment that read "May all your paths lead to Happiness" and stamped the seagulls at the bottom of the 4 x 5 1/4 Whisper White Cardstock. If you notice on the cards I did the embossing on the card front with the same embossing folder. 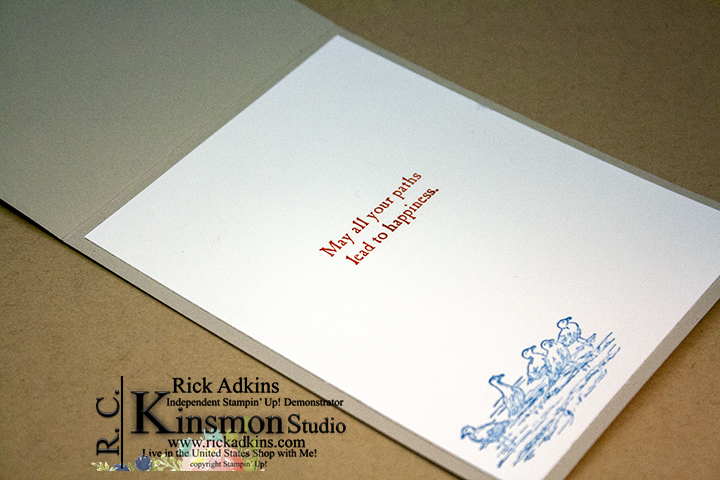 But, on one of the cards I used the embossed side and on the other one I used the debossed side. Which one do you like better? Leave me a comment letting me know which one you like best. 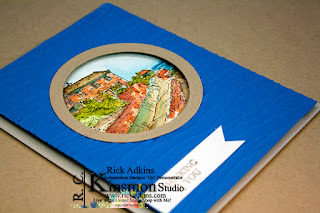 If you would like to get your own By the Bay Stamp Set it's super easy. All you have to do is place a $50 order in my online store and pick it as you free Saleabration item. You will find a full list of the supplies that I used on my cards today under the Product List below.